Almost all prospective tenants use property portals to find their next rental property. As the leading property portal, a Rightmove listing has become a necessity for all landlords hoping to get their property seen by as many eyes as possible. 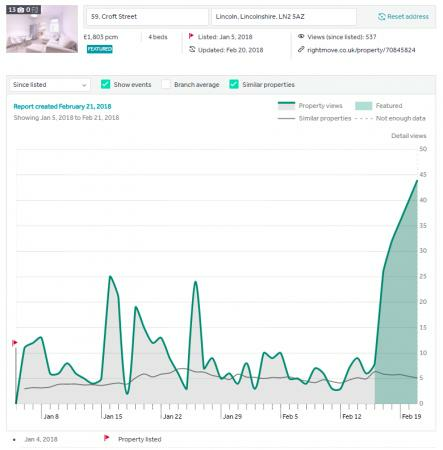 Rightmove receives over 125 million visits a month from its webpage and its app, meaning it covers a massive share of the market for online property searches. The main downside to Rightmove is that with over a million properties being advertised – of which over 100,000 rental properties – landlords can easily find themselves way down the listings and with Rightmove, just like Google search results, very few people are willing to journey all the way to page 4. There are lots of tricks and techniques we can use to maximise the potential of a Rightmove listing but the most important one is the ability to “Feature” a property for a nominal fee. This puts your rental property in a bright blue box and right at the very top of all relevant search results. 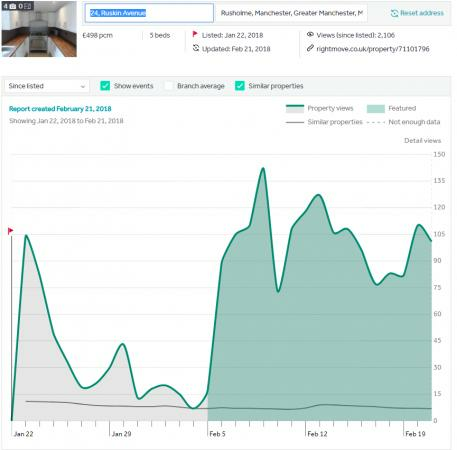 If someone is looking for a property in the area you are advertising in, with the same amount of beds and within the same price range, we calculate that the “Featured” rental property would get around 300% more views when comparing the first 3 days following a property being featured, to the 3 days prior. There are lots of varying factors such as the density of properties for rent in the area and how long the property has been on the market but having researched the effectiveness of “featuring” properties since late last year the data has conclusively proven that having a property “Featured” gives you a much higher success rate of getting a quick tenancy. By analysing the results of hundreds of rental properties our private landlords have added to Rightmove, we found featured rental properties are especially effective in high-density areas with high demand. The most successful use of this service to date was for a Manchester student property, during January, when a lot of student properties are being advertised for the next academic year. As this area is very popular for accommodation with students from the city’s two large universities, there is a large number of properties available and this can cause a major difficulty, however, featuring a property increased page views by over 725% and viewing requests tripled. Whilst we would usually recommend “featured” as a tool to re-invigorate interest in a property, we have had several landlords over the past two months combine our 7-day free service with 7 days of “featured” which has led to all those properties finding tenants. This rental property listing strategy is very dependent on knowing the demand in your area is sufficient and knowing the price will be attractive to potential applicants. However, if you are looking for a quick let, investing in your Rightmove ranking is certainly worth consideration. When considering featuring a rental property it is always best to make sure your three first photos show off your property in the best possible light. Most adverts commonly have the living room first, then the front of the property and then the photos organised by rooms thereafter. Rightmove Featured gives an extra photograph to really catch the eye with. This photo should be the stand out feature of your property, providing a unique touch. If you have a gorgeous well-maintained garden, a sparkling conservatory or even unique artwork, choosing to feature the unique elements of your property can help you stand out from the crowd. To help you make the most informed decision, we have a couple of other suggestions as to how to increase your Rightmove listings efficiency and keep yourself relevant in the search results. Many private landlords choose to keep their property off the market for 14 days following an unsuccessful spell trying to advertise it. This offers the opportunity for the ad to re-appear right at the very top of the Rightmove searches all over again. If this is combined with significant visual improvements to the property, such as new photographs to highlight the change, it can be a very effective method to getting a whole new wave of interest, but it does come with the downside of 2 weeks of inactivity and the cost often associated with that. Another solution we commonly recommend is a price reduction. If you can’t get viewings or offers on your property at your initial asking price, reducing the rental price may be worth considering. Any reduction over 2% will automatically cause Rightmove to send out an automated e-mail to everyone searching in your property’s location, informing them that the property was recently reduced, and it spends 24 hours appearing with a marker on the advert to show this. Reductions in rental asking prices can spur interest in regularly overlooked properties and certainly create spikes of interest in the 24 hours following the reduction. However, reductions do come with a long-term decrease in the income from the property that not all private landlords are willing or able to absorb. At MakeUrMove we do our best to prevent properties being on the market too long, as a property listing stagnating and dwindling in interest can become very expensive for our landlords and the risk of falling down the ranks of properties. We are incentivised to ensure properties are let quickly as the longer a property the more costs we incur from advertising and operational costs. Recently, we had one incident of an applicant pulling out at a very late stage and leaving us with a property that no longer had the momentum of a new listing. This could have been very detrimental to the timeframe in which the landlord started a tenancy but because we were able to feature the property, interest shot up and we found an alternative tenant for the property shortly after. Whether used as a tool to maximise interest in a property, to solidify a quick tenancy turnaround or to re-invigorate a listing that’s decaying in interest, featuring your rental property is a very effective tool in making sure your property reaches the maximum number of eyeballs possible. To add your rental property to Rightmove and all the major property portals, and to find good tenants faster, simply list your property with MakeUrMove today. With MakeUrMove it’s easy to feature your rental property on Rightmove. Simply log in to your landlord dashboard and add the featured listing option to your property.